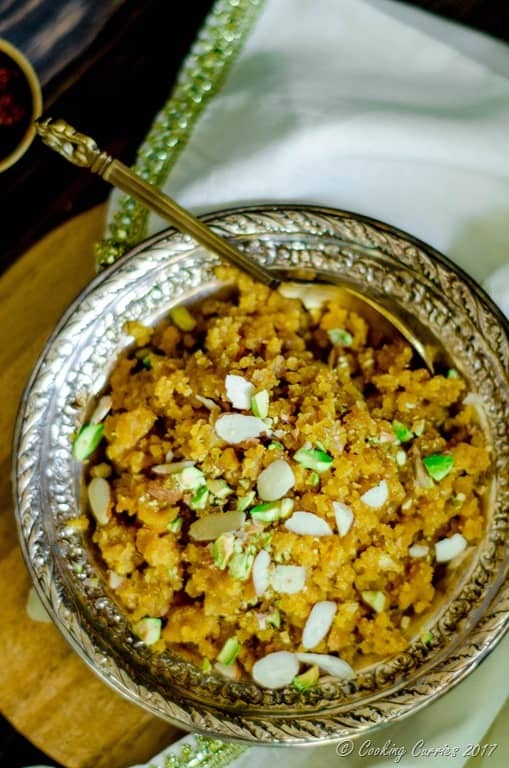 This fudgy pudding like dessert made with chickpea flour, sugar, ghee and flavored with saffron and cardamom is rich goodness in every spoonful. 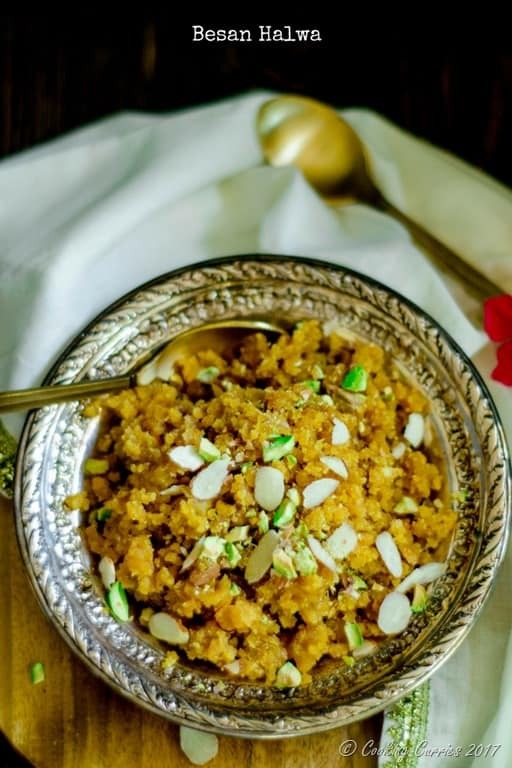 Done in under 30 minutes, this Besan Halwa is perfect to celebrate any special occasion. No festival is complete without a sweet something right? 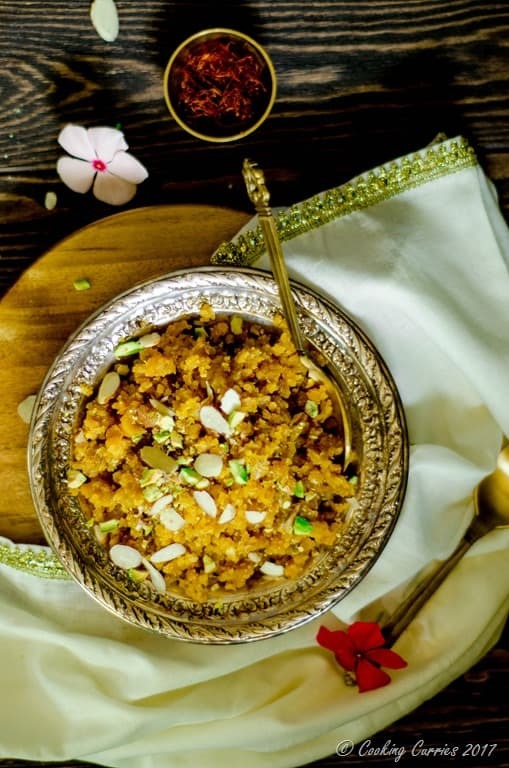 Any time, there is a special occasion or a festival or any kind o celebration, the first thing that comes to my mind is dessert or something sweet. I mean, that’s the best way to celebrate something. And I am always on the lookout for quick and easy recipes that I can make without slaving over the stove for hours. 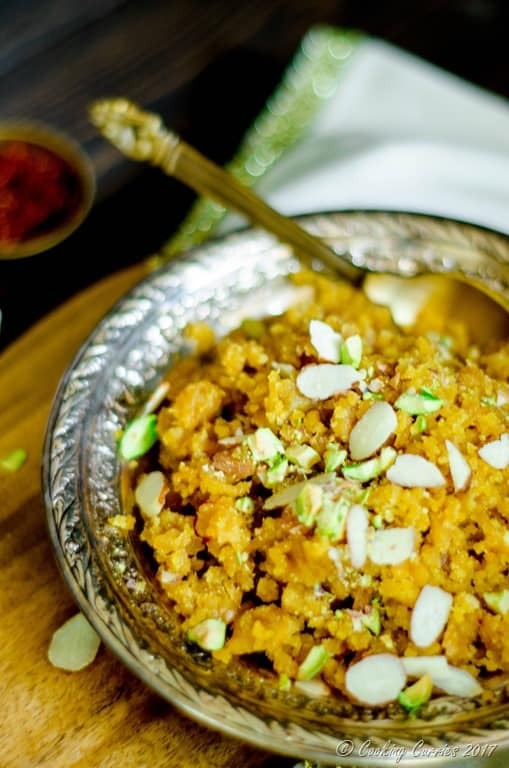 This besan halwa is one such recipe. And the bonus is, I always have these ingredients on hand at all times. Heat half the ghee in a kadhai / heavy bottomed pan over low heat and add the besan to it. Fry the besan, while constantly stirring it, till the besan starts to turn color a little (gets darker) and get a nutty roasted aroma. Warm 2 tbsp of the milk and add the saffron to it and let it bloom. Now add the milk or water to the besan a little by little, mixing well, so no lumps are formed. Cook the besan mixture for a couple of minutes. Add the cardamom to it as well as the bloomed saffron. Mix well. Add the ghee at this moment and mix together. Now add the sugar and let it cook together. The sugar will release water as it melts. But dont worry, just keep cooking and it will all come together in just a couple of minutes. Once the mixture thickens up a little, remove from heat and let it cool down a little. Top with the almonds and pistachios and serve warm.